Laser hair removal works by targeting the melanin in the hair shaft, that is why if hair is white or gray, it will not work. It typically takes 6 treatments to achieve hair reduction (every 6 weeks). Patients with bio-identical hormones, polycystic ovarian disease or patients wanting laser hair removal during puberty, often need several more due to the continued hormone stimulation. The wavelength that works the best is the Alexandrite wavelength. This wavelength is what is utilized on lighter skin type patients. Darker skin type patients need an Nd:YAG laser to avoid the melanin in the skin. 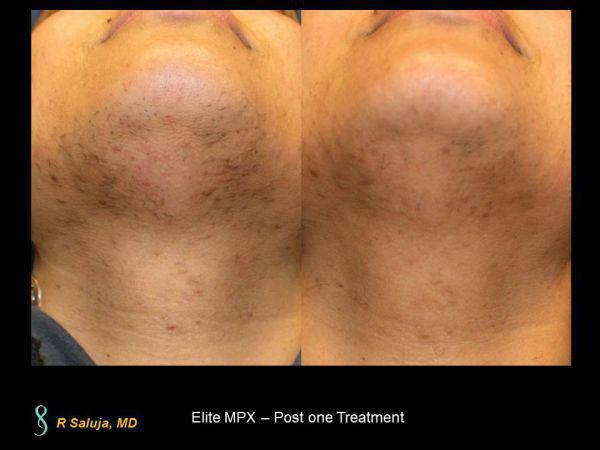 At Saluja Cosmetic and Laser Center, we offer both wavelengths with the Elite MPX laser so that optimal settings and wavelengths can be selected based on the patient's skin type.